Emily Ruff, Executive Director of the Florida School of Holistic Living, is a community herbalist who has practiced the art and science of plant healing for over fifteen years. She cultivated a love of gardening and botany in childhood while wandering the wilderness and digging in the sandy soils of Florida with her grandfather, a fourth generation tobacco farmer turned urban gardener, and her father, a botany and astronomy professor. Her journey into the study and practice of herbalism followed, through apprenticeships in Guatemala under the tutelage of traditional healers on the southern coast of Lake Atitlan, in the mountains of Vermont at the feet of pioneering herbalist Rosemary Gladstar, and in the Central Florida apothecary Leaves & Roots under the mentorship of herbalists Carolyn Whitford and George D’Arcy. 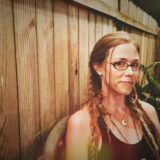 Emily’s work focuses on service to the plants and her community, with accomplishments including founder of the Florida Herbal Conference, co-founder of Orlando’s Homegrown Local Food Cooperative, and, in response to the tragic shooting at Pulse Nightclub, founder of the Orlando Grief Care Project. Building upon these roots, her recent work continues weaving a web of compassionate healing action through the founding of the Herbal Action Network and dedicated involvement with the Medic & Healer Council at the Standing Rock prayerful resistance encampments. She serves as a board member of United Plant Savers, in dedication to preserving bioregional medicinal plants. Emily’s classes have been described as “heart-filled,” “enriching,” and “empowering,” creating a bridge between the teachings of our ancestors and the technologies of our modern world. Emily stewards an urban homestead in Central Florida, where she can be found joyfully preparing healthy food, practicing yoga, writing, photographing flora, creating music with family and friends, and digging her fingers in the dirt. The plants continue to be her greatest teachers. (https://www.holisticlivingschool.org/).